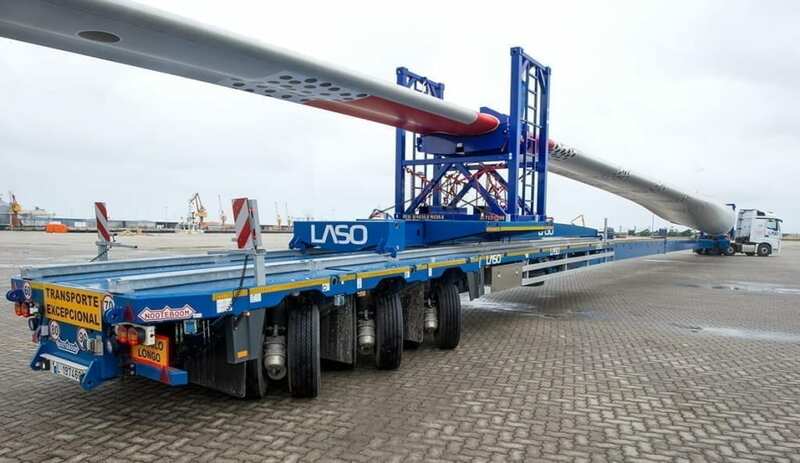 LASO Transportes SA from Malveira in Portugal has strengthened their fleet for the transport of windmills with no less than 6 Super Wing Carriers for the transport of ultra-long rotor blades, as well as a significant number of extendible 4-axle semi low-loaders. All the SWC Super Wing Carriers have been delivered and are in full swing. In the last 6 months LASO has made an investment of 9 million Euros on 70 Nooteboom trailers and new trucks, amongst them the new Mercedes SLT to 250 Tons. LASO is by far the largest operator in the windmill transport sector on the Iberian Peninsula and with their extremely modern fleet they are one of the major players in Europe. LASO has every semi-trailer that you can think of at their disposal, including the Mega Windmill Transporter, which enables them to carry out any transport related to the wind turbine industry. With the Nooteboom semi-trailers the fleet is equipped in a way that is so multi-functional and universal that components from all windmill producers’ makes can be transported. Not just within Europe but far beyond. 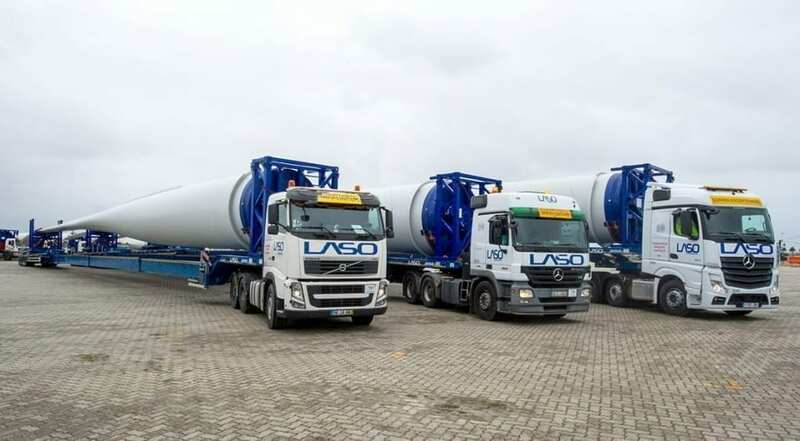 LASO Transportes SA, with headquarters in Malveira, Portugal, is one of the major companies for special transport in Europe with a very large specialisation in windmill transport. The transport fleet of LASO contains over 850 units. As far as the tractors are concerned, LASO has by now more than 200 Nooteboom semi-trailers, varying from simple 3-axle semi low-loaders to the most advanced Super Wing Carriers and Mega Windmill Transporters. Nooteboom, as Royal Warrant Holder, has had strong ties with LASO Transportes S.A. for many years. The Nooteboom programme and organisation compliment the mission of LASO perfectly. Their mission statement: ‘To be the best service provider in the area of road transport of goods, both inside and outside Portugal, and to be recognized by our high performance, in a continuous search for excellence’.